I came back from Italy without treats for my lovely new team at work (there was not an inch of spare room in the bags after we got a bit over-excited in the fine shops of Naples). 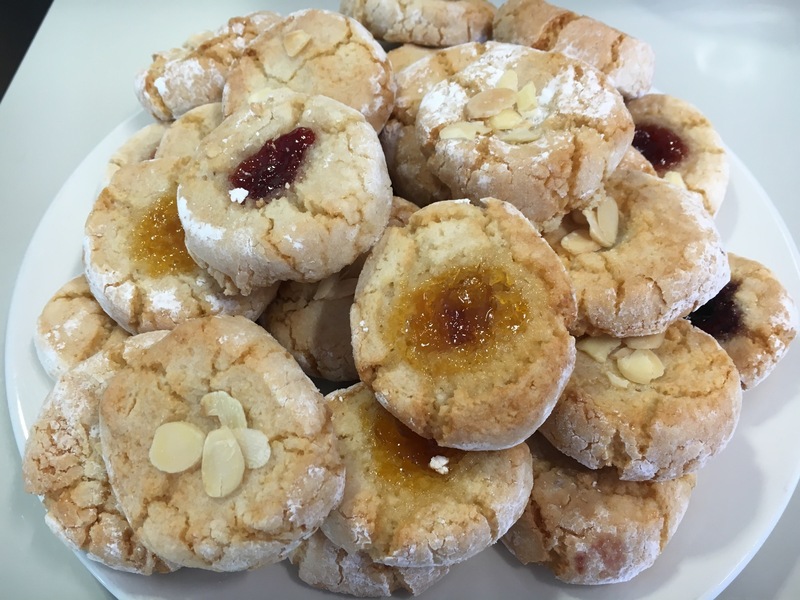 So to make amends I rustled up a batch of these gorgeous Italian biscuits from Richard Bertinet’s excellent Pastry book. I’ve written about these before, but this time I’ll include the recipe. They are easy to make, totally delicious and a great way of using up spare egg whites (I usually have some in the freezer). Mix the icing sugar and ground almonds together. Add the honey and egg whites and mix till you have a smooth firm dough. Leave to rest in the fridge for at least half an hour. Pre-heat the oven to 150ºC/300ºF/Gas mark 2 and lightly grease two baking trays. Divide the dough into four equal pieces. Dust a work surface with icing sugar, and roll each piece of dough into a sausage shape. Slice each sausage into 8-10 pieces. Lay these onto the baking trays and gently press your thumb into the centre of each, leaving an indent. Fill the indents with a little jam or some flaked almonds and bake for around 15 minutes. In other news, it was the local Horticultural Society Autumn show last weekend. Jenny and I now have a pact that we will enter five items each and retain our sanity. This is much better than our previous attempts to enter pretty much every category! 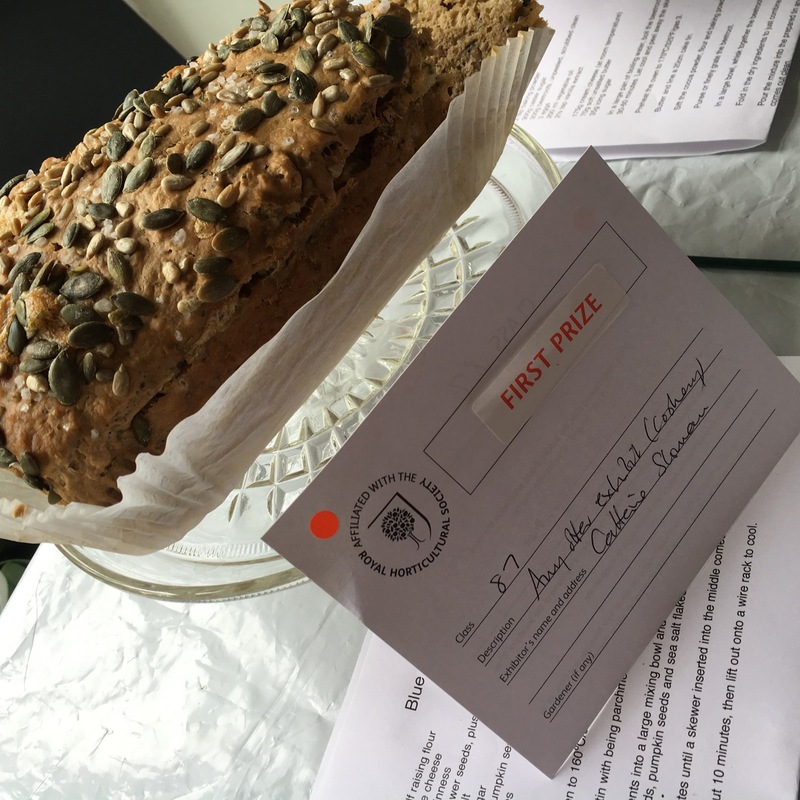 I was very pleased to get a first prize for my chocolate and beetroot cake (not one I’d made before). This fantastic blue cheese and Guinness loaf also got a first. This one is courtesy of my friend Chris and is another quick and easy one – I love spending hours baking with yeast as much as the next woman, but there is also something very satisfying about getting up just a bit earlier than everyone else and serving this warm for breakfast. Line a 900g loaf tin with being parchment. Put all the ingredients into a large mixing bowl and combine. Transfer to the prepared tin, scatter with sunflower seeds, pumpkin seeds and sea salt flakes. Bake for 50-60 minutes until a skewer inserted into the middle comes out dry. Cool in the tin for about 10 minutes, then lift out onto a wire rack to cool. The scoring remains as mystifying as ever and my not quite set strawberry jam came in second – tasty but definitely not quite right!